For over a decade, photographer Nick Brandt has recorded the majesty of wildlife in East Africa, and from the start he has been a class of his own, with dreamy, monochrome images that never look like typical shots from safari. The work also has an elegiac quality that is detectable even to those who might not know that his subjects are being driven to extinction by human activity. In his latest series Inherit the Dust, he includes the human element—the destruction of habitats, the environmental degradation—and shows the unity of environmental and humanitarian crises. Brandt’s artistry arrests the eye, even if the material is darker and challenging. Ideally, such work will lead to more nuanced views of the continent and the global forces shaping it at present, but there are significant hurdles to overcome. Western audiences generally have two simplified views of Africa, which have been shaped by entertainment and the aid industry: Africa is 1) poor and unstable, and 2) one big safari. At a glance, Inherit the Dust might appeal to both, but closer examination undermines these assumptions. The urban scenes counter the latter view, and when one considers this and the mineral resources evident in other images, one wonders if in fact Africa is truly without means. Why are there vast plains of refuse if there is not also mass consumption? 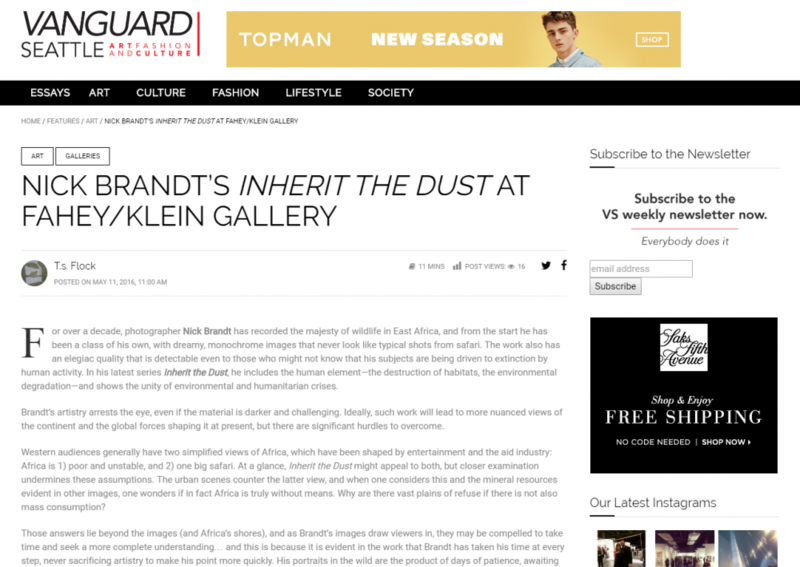 Those answers lie beyond the images (and Africa’s shores), and as Brandt’s images draw viewers in, they may be compelled to take time and seek a more complete understanding… and this is because it is evident in the work that Brandt has taken his time at every step, never sacrificing artistry to make his point more quickly. His portraits in the wild are the product of days of patience, awaiting the perfect moment. The images of Inherit the Dust are also time-intensive, but different in that they rely on complicated staging to achieve their effect. Brandt showed his skill at arranging a good vanitas in his surreal images of salt-cured birds at a lake in Tanzania. (These may in fact be his most widely viewed works, as the series went viral online in 2015.) The scale of the vanitas is much larger in Inherit the Dust—not an individual life, but a way of life and several species.